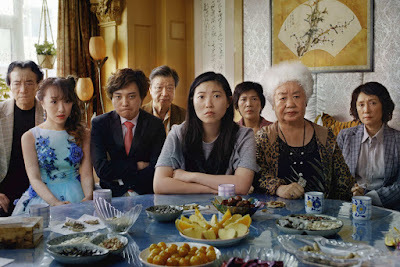 Within the first few minutes of Lulu Wang's The Farewell you start to realize how special this movie could be. Billi (Awkwafina, a revelation here) walks the busy Manhattan streets while chatting with her grandmother Nai Nai (the charming Shuzhen Zhou) who lives halfway across the globe in China. Nai Nai is focusing all of her energy on Billi, while trying to hide that she's actually in a doctor's office for an MRI. The one who actually hears from the doctor first is her sister, Little Nai Nai (Lu Hong), who learns the diagnosis is inoperable lung cancer. Chinese law doesn't require doctors to give such news directly, and culture actually encourages family not disclose that kind of information to the patient. Thus begins a bittersweet, but mostly sweetly hilarious, web of lies to keep Nai Nai, the family matriarch, in the dark while giving everyone a chance to say their goodbyes. The Farewell is a movie full of unique insights on family and what it means in different parts of the world. At the same time, it feels like a story that's universal and yet very personal to Wang. The remarkable tale first gaining attention in a 2016 episode of This American Life, and the film adaptation is just as rich in humor, touching moments, and revelations. Billi is particularly close to Nai Nai, and as her parents (played exquisitely by Tzi Ma and Diana Lin) prepare to fly off to attend a phony wedding concocted so the family has a reason to get together in China, she's warned not to come. Billi wears her feelings on her sleeve, she'll never be able to keep the secret from Nai Nai. But Billi flies there on her own, reconnecting with the birth country she left as a child. While the central focus of Wang's film is the big lie everyone is telling to spare Nai Nai, beneath the surface is this current of sadness for those in the family who have struck out on their own. Billi and her parents flew off to America years before and we can sense the disconnect. Billi's uncle journeyed to Japan where he found success as a businessman; another aunt plans on sending her young son away to learn in America. Chinese culture teaches that no one person's life is simply their own, it is just a small part of the whole. In geek terms, Billi and others in her family have been separated from the Borg collective, and now they're trying to learn how to fit back into it, which causes all sorts of family conflict, which Wang handles with nuance, deft insights, and comedy that could only come from her own life. These aren't people who hate one another; they just don't know how to relate after so long apart. A particularly awkward dinner scene mines comedy gold as everyone tries to prove how Chinese they still are, regardless of what it says on their passport. The Farewell is another look into the Chinese way of life, but don't expect another Crazy Rich Asians. While everyone in the family appears to be doing well, Nai Nai lives in a part of town that is a little bit sketchy, and certainly nobody is flaunting their wealth or living in a McMansion. But Wang acknowledges the shifting economic landscape. The places Billi remembers as a child, including Nai Nai's old home, have been bulldozed and replaced by larger, less distinctive structures. It mirrors in some ways the destruction of Billi's connection to China, and the loss of her beloved Nai Nai is another. Wang gets a ton of comic mileage out of the family's many squabbles, which are always out of love or a cross-cultural misunderstanding. Awkwafina is one of the film's many revelations as she proves more than just than just the comic relief. The dramatic weight is mostly put on her shoulders and she proves more than capable. But the entire ensemble is terrific, with Wang gathering together some truly great, and mostly underappreciated, Chinese actors. Each gets their moment to shine, as one-by-one everyone in the family must come to grips with what the loss of Nai Nai will mean to them personally. Of course, the morality of keeping such a secret is explored; doing such a thing would be illegal in America, for instance, but Wang never passes judgement. By the time the big wedding event actually occurs, your view on the lie they've told may have changed three or four different times. The Farewell is brilliant that way, revealing truths we may have never considered, and doing it with a light-heartedness that cuts through the heavy subject matter.